Ergonomically designed, a soothing combination of white and blue, soft edges and curvy body, every detail carefully considered to enhance your experience. 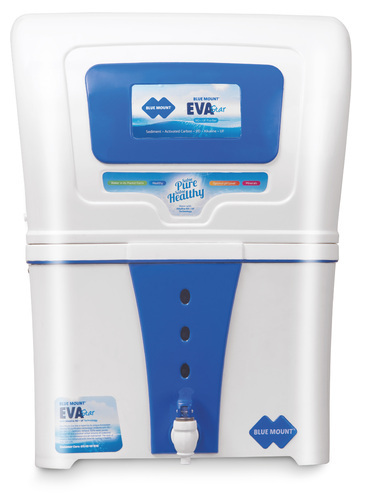 An elegant one finger press tap makes it easy to dispense water and prevents leakage or wastage. All the fittings and components are push-fit with rubber O-rings for easy assembling and dismantling preventing leakages or wastage of water. The compact size makes it fit in any kitchen without occupying much space. All plastic parts are 100% Food grade and unbreakable ensuring that no harmful chemicals leach into purified water and it remains safe and pure while in the purifier for long duration. The auto on and off system detects the water level in the purified water storage thus self-starts or stops purification accordingly and auto fills the storage tank. The purifier detects and automatically stops if it detects any leakage anywhere in the system. The inbuilt alarms automatically alert the user when it's time for filter change or if any component is faulty. User can trust that the water which they get is always pure. The in-built auto flushing washes the RO membrane surface on periodic intervals to remove any salt deposits. It improves the life of the RO Membrane and increases it's efficiency in keeping water clean. The built-in SMPS is resilient to frequent power fluctuations of ~AC voltage (100 - 300 Volts). It works on a mere 24 volt DC meaning it consumes less electricity compared to other RO purifiers.